In the light of recent wins it is only fitting that I announce what I feel to be the best audio book of 2015. I know I haven’t listened to many this year – but this one stands out – the narrative is excellent and the narration brings the story to life. I highly recommend this for all parents, grandparents, teenagers to read or listen to. This will change your awareness of the power/influence of social media. 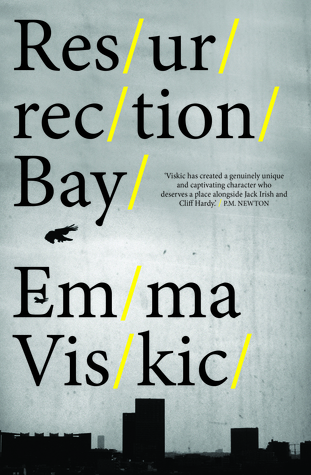 Resurrection Bay is the exciting debut novel by Melbourne-based award-winning crime writer Emma Viskic. (positive, 5 stars) to this book. It was a great read, a fantastic debut, a great new voice in Australian crime fiction. It is an inclusive and diverse voice; the language deftly written laced with laconic dry humour (Caleb has a typical Australian self-deprecating sense of self and humour) and there are Indigenous characters, artists, cops, villains, drug users, strong men and women, a range of people and lifestyles that form a part of this rich cultural landscape. Emma Viskic’s characters reflect a diverse Australia. Caleb is profoundly deaf. (Have I ever come across a protagonist in crime fiction who is deaf? I don’t think so.) Caleb’s disability is portrayed with credibility and intelligence – his disability informs his attitudes (he is quiet, some say uncommunicative, keeps mainly to himself, and stands back, observing rather than participating in life around him) but his disability doesn’t define him, perhaps it more accurately defines those around him by their responses to his deafness. Caleb is intelligent, he has mastered the art of reading body language and nuances in behaviours/responses, and language (he lip reads and has hearing aids) and uses his skill to his advantage in both his public and private worlds …he is determined and thorough in his work, he suffers relationship issues like anyone else. He is not perfect. He is… himself. A complex human. Enough of the protagonist – other characters in this narrative are interesting and humanly portrayed, diverse and real. The plot – interesting, twisty and at times bloody – (it is a crime story after all) and there are a couple of reveals that I did not see coming. The back story about Caleb’s relationship with his ex-wife and their struggle to deal with loss (no spoilers here) is a universal story about relationships and adds depth, interest, layers…a richness to the storytelling. The settings – Melbourne, Australia – city and regional; always great to have a landscape that speaks to fellow Australians. What else can I tell you without giving you a rehash of the narrative? This is an intriguing and engaging read. At times the tension cuts like a razor – swift, sharp, painful. You will not forget this story, you will not forget this cast of characters. You will want to read the next in this series, I do. I think I am done. Dan Taylor has survived two attempts on his life. The rest of his team are missing, and now a terrorist group has stolen a radioactive isotope from a top secret government project. Can Dan survive long enough to prevent a nuclear disaster on British soil? With the Prime Minister determined to re-negotiate the country’s place in the European Union, and deals being struck behind closed doors, Dan stumbles across a plot that will shake the country to its core. If his mission fails, his enemies will overthrow the British government, and Dan will be a wanted man. If he wants to succeed, he’ll have to sacrifice everything. A surprisingly good novel! Surprised – yes I was – very pleasantly so. I am sorry to say I had not come across Aussie author Rachel Amphlett before and didn’t really know what I might find when I opened this book. When I decide to read a new author there is always a little trepidation involved – will the book live up to my expectations – and those expectations are pretty high? I wasn’t disappointed. What a great read it was. Despite not having read the first two books in the series I had no problem relating to the main characters or understanding the situations they found themselves in. I was quickly enmeshed in this read. The action is fast paced, the tone tense and the situations highly credible. I loved that Rachel wove a sub story about fracking into this mix – the world really does need to know about and understand the potential problems that relate to this practice and the situation in this novel is very sensitively and powerfully delivered without hysteria or emotional blackmail. Great work Rachel. I am no fan of fracking and I do not apologise for my view. Will you be up all night reading this – most definitely! Would I recommend to you – most certainly! My rating – five stars! Rachel Amphlett is star! She has achieved so much in her relatively short writing career. Rachel has successfully self-published and promoted her books and the Italian foreign rights to White Gold, the first book in this series, were sold last year to Fanucci Editore’s TimeCRIME imprint, the same imprint that publishes David Baldacci, John Connolly, and Karin Slaughter. What a coup! 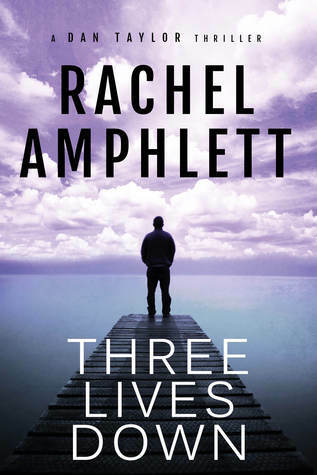 Rachel Amphlett is a writer we are most certainly going to hear lost more about! The body of a journalist covering the race is found in a House of Horrors, an English blueblood with Blackshirt affiliations is killed on the race track, and it seems that someone has Rowland in their sights. A strange young reporter preoccupied with black magic, a mysterious vagabond, an up-and-coming actor by the name of Flynn, and ruthless bookmakers all add mayhem to the mix. With danger presenting at every turn, and the brakes long since disengaged, Rowland Sinclair hurtles towards disaster with an artist, a poet and brazen sculptress along for the ride. The sub-genre historical crime fiction is more than the re-imagining of an incident set in the past; when executed skilfully it is engaging, thought provoking and shares the authors passion for the era and their understanding of the society and culture of that period. Sulari Gentill’s passion for this era is obvious on every page. 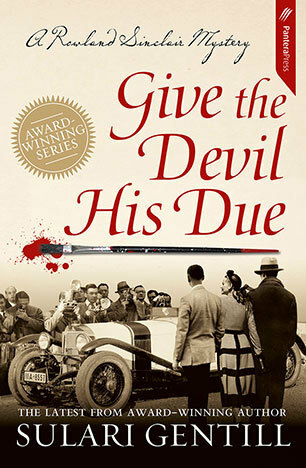 The tone, style and colour of this narrative paints an evocative and very visual account of Australian society in the 1930’s. I love reading crime fiction based in this period – the time frame is far enough removed from my life that I have no firsthand knowledge of the time yet the period is still relevant and interesting and accessible. Records still exist from that time frame: news reels, documentaries, oral histories, films, art, fashion, music etc. that allows us a glimpse of the past, it is the context, the social fabric, the political views and the mystery that this talented author weaves into the narrative that makes this work so engaging. And did I mention great characters? I particularly enjoyed reading about Ed – Edna Higgins; a creative, talented, generous and strong individual who does not conform to societal pressures that inform how a 1930’s woman should be; she is herself. What a wonderful discovery – JM Green I cant wait for your next book! Enlisting the help of her friend, Senior Constable Phuong Nguyen, Stella’s investigation draws her further and further into a dark world of drug dealers, sociopaths, and killers, such as the enigmatic Mr Funsail, whose name makes even hardened criminals run for cover. 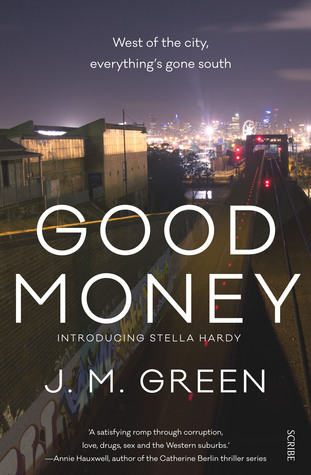 Set in the bustling, multicultural innerwest of Melbourne, Good Money reveals a daring and exciting new voice in Australian crime fiction. What a wonderful discovery – JM Green I can’t wait for your next book! (But really could be almost anywhere these days), the honesty and the friendships and of course, the great engaging narrative. This is crime fiction at its most human level – a narrative that clearly shows the effect of acts of crime on the victims, families of the victims, the cops and the social workers. Corruption, drug use, gangs, prejudice, structural misogyny…all are highlighted in this work – but please don’t misunderstand me – this book is a joy to read (aside from the murders which are naturally, sad), the characters are so natural, the language, discussions, conversations so fresh and real, the relationships credible; everyday lives exposed but this is not an “ordinary” life, nor an “ordinary” narrative, at times it is fun, at times sad, bleak and grim and even romantic, occasionally optimistic and always with a thread of tension that pulls the narrative together tautly. I really loved the protagonist, Stella Hardy and can’t wait to hear more of her adventures. Let Julie Goodwin, Australia’s favourite family cook, show you how to make your favourite takeaway dishes – at home, from scratch! Cheaper, healthier, and even faster than waiting for your order! Feel good about enjoying take away and save money at the same time. 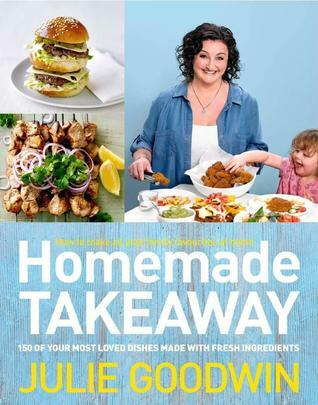 Julie Goodwin is back with Homemade Takeaway. In this beautiful new fully illustrated cookbook, Julie will teach you how to make all your best-loved take away meals. Whether it’s the local bakery or the corner store, chicken shop or your favourite Thai or Indian takeaway, Julie has it covered. There’s no need to go out for comfort food or family favourites like Chilli Chicken with Cashews or Lamb Shank Pie. They’re all here – over 150 recipes that use fresh, seasonal produce to bring you the takeaway food you love. Feel good about enjoying take away with the family, and save money at the same time with Homemade Takeaway. The perfect cook book for the home cook. Be in control of the food you eat; know exactly what ingredients are in the meals you eat and enjoy, quality meals do not need to be exorbitantly priced – simply make the meal at home with fresh season produce, it is easy to do with Julie Goodwin Homemade Takeaway –with step by step guides and great images to guide you along your cooking journey. (all things chicken including southern fried chicken, schnitzel…and sides – potato bake, rice salad, pasta salad and much much more) and then my personal favourite chapter – The Bakery. The Bakery covers all the family favourites – sausage rolls, lamb shank pie (so delicious), finger buns, cherry ripe brownies, flourless chocolate and orange cake, pastries, carrot cake….YUM. As you can see there is something here for all to enjoy .In this book Julie’s love and passion for cooking is evident on every page -as Julie explains “ Anyone who knows me or has eaten at my table will know: enjoyment of the food is paramount. It must be generous, flavourful, hot out of the pans or from the oven; eaten in good health and good cheer; shared with people whose company you love. It should bring happiness to all who eat it.”(Introduction p.X) It is no wonder Julie Goodwin is one of Australia’s best loved food creatives. How can four sisters build the futures they so desperately want, when the past is reaching out to claim them? A warm and wise novel about secrets revealed, finding your soulmate and the unique bond between sisters. 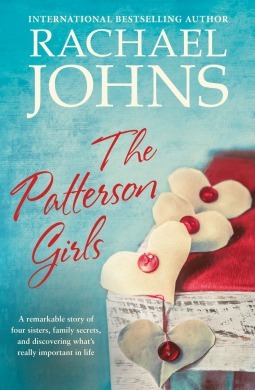 Engaging, entertaining, salacious; this narrative is a blend of many genres including romance, contemporary fiction, drama and a lot of family and relationship issues set in many locations including London, Baltimore, Perth, Melbourne and small town South Australia mixed with a glimpse of the trials and tribulations of long distance relationships in this era of the fly out work workforce. I particular enjoyed the settings – it is always a joy to be able to identify an area that you are familiar with in a read and when Lucinda and Joe take their romantic trip to the South West of WA – Bunker Bay, I could picture the area clearly – and then I could not believe the coincidence – Rachael Johns has this couple stop for an ice-cream – in the exact location we stop for an ice cream when we do a trip from Perth to home – a road house between Bunbury and Busselton. How amazing. (I would love to have been researching this book, so many great locations). This narrative is big on drama, big on issues (infertility being the binding issue, it is good to see this issue being aired in such an upfront way, it is a topic that needs more public airing). Themes regarding identity and family; obligations, ties, secrets, history and connections all play a part in this complex story. Each sister has an opportunity to share their view point as they take turns in narrating. This is very much a character based plot and the different personalities are very well expressed and the connections and expectations within the family unit are ones we are all familiar with. Overall an entertaining read that has much to offer the contemporary reader.